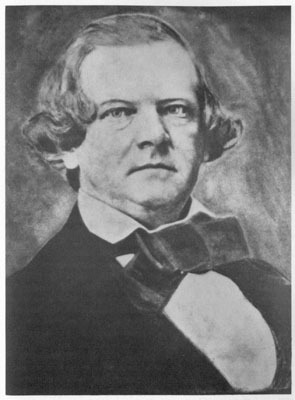 This portrait is of the third superintendent of the Dahlonega Mint, James Fairlie Cooper, who served from June 1843-October 1849. Cooper, a West Point graduate, ran the mint with military bearing during one of its most productive periods. Source: Head, Sylvia Gailey and Elizabeth W. Etheridge. The Neighborhood Mint, Dahlonega in the Age of Jackson. Macon, GA: Mercer University Press, 1986, page xvii. There courtesy of Mrs. Marian G. Hammers and the Atlanta Historical Society.